Good morning. It gives me great pleasure to join you and to welcome you to this Symposium on the Guangdong-Hong Kong-Macao Greater Bay Area jointly organised by the People's Government of Guangdong, the Government of the Hong Kong Special Administrative Region and the Government of the Macao Special Administrative Region. In case you are not aware, this is the first joint promotion overseas undertaken by the three governments of Guangdong, Hong Kong and Macao since the promulgation of the Outline Development Plan governing the Guangdong-Hong Kong-Macao Greater Bay Area in February this year. I hope that is an indication of the importance we attach to the third largest economy in the world and the friendship that we have established over the years which Ambassador Cheng has just talked about. We are much encouraged by this turnout this morning. I was told by my colleagues that we have an enrolment of 1 200 and 70 per cent are Japanese enterprise representatives. That is a very good indication of the interest of our Japanese counterparts in this regional development in the People's Republic of China. But this encouraging turnout would not be possible without the support of many organisations, and since I'm the first to speak on behalf of the three governments, let me extend my warmest appreciation and gratitude to these organisations. The first one is of course the special support offered by the Embassy of the People's Republic of China in Japan, especially Ambassador Cheng Yonghua himself. He hosted a lovely dinner for us last night and is coming today to give us a wonderful opening address. And we are thankful to quite a large number of supporting organisations in Japan, in Hong Kong and in the Greater Bay Area. They include the Japan Business Federation, the Japan Association of Corporate Executives, Japan Chamber of Commerce and Industry, the Guangdong-Hong Kong-Macao Greater Bay Area Entrepreneur Union and the Hong Kong Chinese General Chamber of Commerce, from which we have a strong delegation over there. They all wear the same tie so you can easily recognise these members from the Hong Kong Chinese General Chamber of Commerce. And I want to especially thank one person who has helped us to achieve this great turnout and encouragement, and this is Dr Jonathan Choi, the President of the Hong Kong Chinese General Chamber of Commerce. And of course we are very grateful to Mr Nobuhiko Sasaki, Chairman of JETRO, Japan External Trade Organization, and State Minister Yoshihiro Seki, who will join us in a moment from METI, the Ministry of Economy, Trade and Industry. Both of them will share a few words of wisdom with us later on. As I said, since I'm the first to speak on behalf of three governments, I will start with a little bit of background about this Greater Bay Area before I talk about Hong Kong's role in the development of the Greater Bay Area. The Greater Bay Area occupies a very important part of the People's Republic of China at the southern part of it. The total area is 56 000 square kilometres. In terms of population, it now has 71 million, which is larger than the country of the United Kingdom or France which is about 66 to 68 million people. In terms of Gross Domestic Product, and that is the size of our economy, the Greater Bay Area amounted to US$1.6 trillion last year and that was 12 per cent of China's GDP and almost the same as the entire size of the economy of the Republic of Korea. This gives you a very good indication of the prospects and potential of this region. The characteristics of this Greater Bay Area is that, first, it enjoys very distinctive geographical advantages with the most intensive cluster of airports and ports in the world - I'll show you some figures to demonstrate that later on. It has enjoyed very robust economic growth. As you know, Guangdong is the fastest growing province in the entire People's Republic of China. Hong Kong is now a mature economy, so we grew by a smaller percentage - about 3 per cent real growth last year. But in the whole region, it is still full of vibrancy and vitality. It has a high concentration of key areas in innovation. We are talking about research and development, advanced manufacturing and the market development. We have an advanced level of internationalisation partly because of the two Special Administrative Regions of Hong Kong and Macao, that over the years we have established very strong global connections. We have very solid co-operation foundations. Prior to this Greater Bay Area, there are mechanisms like the Hong Kong/Guangdong joint conference and the Guangdong/Macao joint conference, which meet annually to talk about mutual interest affairs, and that's why myself and Governor Ma are very good friends because Governor Ma used to be the Party Secretary of Shenzhen, which is a neighbour of Hong Kong and one of the most prominent cities in the Greater Bay Area. Most important of all, we enjoy "One Country, Two Systems". This unique arrangement is not available in other regional developments in the People's Republic of China, and I can assure you that in the development of the Greater Bay Area, we will be seeing more co-operation, more integration, but it will not dilute the principle of "One Country, Two Systems". In the Outline Development Plan, which you will get the copy of later on, one of the guiding principles as laid out in the Outline Development Plan is the importance of "One Country, Two Systems". 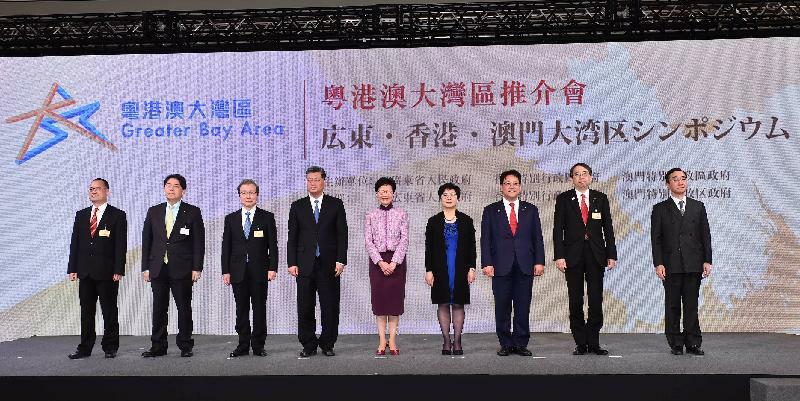 In one of the public meetings, Vice-Premier Han Zheng said the development of the Greater Bay Area is not going to undermine the "One Country, Two Systems" nor dilute the "Two Systems". Our important mission is to find ways to grow this region, upholding this very important fundamental principle of "One Country, Two Systems". We are right now in another very important bay area in the world, so let me just give you a little comparison of this Guangdong-Hong Kong-Macao Greater Bay Area with the other three prominent bay area economies in the world. They are the Tokyo Bay Area, the New York Metropolitan Area and the San Francisco Bay Area. In terms of geographical size, of course 56 000 square kilometres is huge, and we are the largest in terms of size. We are also the largest in terms of population. In terms of annual airport freight turnover as well as annual port container throughput, because we have the largest cluster of airports and ports in the world, both figures are also the largest amongst the four bay area economies. In terms of Gross Domestic Product, we are slightly behind the Tokyo Bay Area and the New York Metropolitan Area at US$1.6 trillion, but with the high growth, especially with Guangdong taking the lead, I'm sure we will be able to catch up. The Greater Bay Area is a national strategy. It's not just the three governments coming together to do something that we want to. It is at the national strategic level mentioned by President Xi Jinping, and actually personally conceived and steered by President Xi himself and was featuring in the annual report of Premier Li Keqiang. The mission of this Greater Bay Area is two-fold. One is it is a new attempt to break new ground in pursuing opening up on all fronts. I am sure you know China has gone through remarkably 40 years of reform and opening up and our country is now entering another phase of further reform and deepening of the opening up and we want to find a new model full of innovation in order to press ahead with that new qualitative development. The second is a further step in taking forward the practice of "One Country, Two Systems". Hong Kong has been reunited with the Mainland of China for almost 22 years. We have successfully implemented "One Country, Two Systems", maintained stability and prosperity. But the time has come for Hong Kong to break new ground in order to take our economy to the next level and the Greater Bay Area provides us with that exceptional opportunity. The objectives of the national strategy in the Greater Bay Area development are: To promote co-ordinated regional economic development, so don't just compete but complement each other. Complementarity is going to be one key principle in the Greater Bay Area development. The second objective is to give new impetus, especially to the development of Hong Kong and Macao. The third objective is to build a new system of open economy. I'm sure you've heard a lot about the importance we attach to open economy and a rule-based system. The fourth is to provide a new model of high-quality development. There are several important milestones in the last two years in taking forward the Guangdong-Hong Kong-Macao Greater Bay Area. I would say that the starting point is July 1, 2017, incidentally when I took office as the Chief Executive of the Hong Kong Special Administrative Region. Witnessed personally by President Xi Jinping, the three governments of Guangdong, Hong Kong and Macao, together with the National Development and Reform Commission, signed jointly an agreement providing a framework - that is an outline for the Greater Bay Area development. And from that point onwards, the three governments, together with the relevant ministries in the Central People's Government led by the National Development and Reform Commission, worked diligently on the content of this Outline Development Plan. In addition, knowing very well that the three governments will have a lot of wishes that would require support and assistance from the central ministries, such as taxation issues, customs issues and trade and services issues, upon our strong request, the Central Government has set up a leading group chaired by the Vice-Premier Han Zheng. And the leading group met for the first time in August last year and as a result of that first meeting of the leading group, we now have a mandate from the Central Government to develop an international innovation and technology hub in the Greater Bay Area. The next important milestone is the promulgation of the Outline Development Plan by the Central Government on February 18 this year and a few days later the three governments joined hands again but this time was in Hong Kong to do a promotion, a similar symposium like today's, in Hong Kong to promote and explain the Outline Development Plan. And on March 1 this year, Vice-Premier Han Zheng chaired a second plenary meeting of the Greater Bay Area development leading group, and as a result of that, eight measures were announced after the meeting. I will not go through each and every of these eight measures. You can have a detailed look later on. But these are good examples to show you how we could maintain the "One Country, Two Systems", whether in terms of immigration, customs, tax and financial systems, but still manage to have greater integration to facilitate the free flow of people, capital, goods, information within the Greater Bay Area. The Outline Development Plan in front of you consists of seven substantive chapters. Apart from the guiding principles and the implementation strategy, it has seven important chapters covering the innovation and technology hub, the infrastructure connectivity, the modern industrial system, ecological conservation, a quality living circle for our people, our contribution to the Belt and Road Initiative and finally how we could take forward the Guangdong-Hong Kong-Macao co-operation platforms. Now I will spend a few minutes to talk about Hong Kong's role in the Greater Bay Area. I am sure Governor Ma and Secretary Chan will respectively talk about Guangdong and Macao situation. Hong Kong's competitive strengths lie in: We are an international financial centre. We are ranked the world's number three after New York and London. And we are an international aviation hub. Our international airport was serving 74 million passengers and 5.1 million tonnes of cargo last year. That made us the world's number one in terms of air cargo throughput. We are a very business-friendly society, ranked number four worldwide by the World Bank in terms of ease of doing business, and our business environment is deeply grounded in the rule of law with certainty and clarity. We are the freest economy in the world as ranked by the US-based Heritage Foundation, not for one year, not for two years, but for 25 successive years. We are also a business hub with over 8 700 overseas and Mainland companies in Hong Kong and many of them are using Hong Kong as their regional headquarters and regional offices. We have top-notch universities which make us very well positioned for doing innovation and technology. Four of our universities are among the world's top 100. Hong Kong's key roles in the Greater Bay Area include several areas. We cannot do every sector within the Greater Bay Area but I see Hong Kong playing an important role in financial services because we are an international financial centre, so we'll be able to provide a platform for investment and financing by enterprises within the Greater Bay Area. We can promote financial co-operation and development through connectivity within the Greater Bay Area. We will provide offshore Renminbi business. Right now, we are the world's largest offshore Renminbi business hub. We love to promote green finance because one of the chapters in the Outline Development Plan is about ecological conservation. While we propel our economy, we want to preserve the environment as well. And finally, we can provide quality insurance services to businesses and people within the Greater Bay Area. Our second key role is to be a hub in terms of transport and logistics. I've talked about the important role played by the Hong Kong International Airport, and we are also doing a lot of training for our own people as well as people in the region in aviation. Our port in terms of throughput is coming down a bit because of very fierce competition from ports in Guangdong like Shenzhen and Nansha. But we want to do high-end maritime services in leasing, financing, registration to ports within the Greater Bay Area and we have a mission to ensure the smooth cross-boundary flow of people and goods. Talking about logistics and transport, I'd love to show you this map of the Greater Bay Area. It shows both sides of the Pearl River Delta - the east and the west. All these lines are enhanced transport connectivity. I am sure many of you have heard about the high-speed train in China, now accounting for 29 000 kilometres of high-speed train. Our high-speed train in Hong Kong is only 26 kilometres, but it connects very well the West Kowloon Station in the heart of Hong Kong all the way to Guangzhou, which is less than 50 minutes, actually the fastest train without any stop in between is 43 minutes. I tried it. I am sure the Guangdong Governor has also tried this high-speed train. And across the Pearl River Delta, we need more transport bridges so that the people and goods flow could be facilitated. Of the four links, three have been opened. The lowest one is the very famous Hong Kong-Zhuhai-Macao Bridge. Above it is the Shenzhen-Zhongshan Link, which is under construction and will be commissioned in 2024. Above it is a slightly older bridge called the Humen Bridge, which was opened in 1997. And the top is the Nansha Bridge, which was opened this month. With all these additional bridges and roads, it is a very well-connected area. The third role that Hong Kong wants to play is in innovation and technology. I wouldn't go into detail but I can say that Hong Kong looks to Japan to have greater collaboration in innovation and technology. I have met with the Japan Science and Technology Agency for three times already in Hong Kong and in Japan. And our distinguished universities will continue to contribute to the innovation and technology hub while the advanced manufacturing capability in Guangdong will provide the needed production capacity for the discoveries of innovation and technology. On our own, the Hong Kong SAR Government, especially since I took office about 21 months ago, we have rolled out a significant number of policies to grow the innovation and technology industry and invested a total of HK$100 billion - that is about US$12.5 billion - in innovation and technology from hardware to software, from research funding to talent nurturing. All these will continue in momentum in order to contribute to this innovation and technology area. We are a very important legal services hub within the Greater Bay Area. We also have an ambition to provide services for international legal and dispute resolution actually not only in the Greater Bay Area. We are aiming to become an arbitration and dispute resolution hub for Asia-Pacific. For the other sectors where our strength lies, we also will continue to contribute to the Greater Bay Area. That includes our quality medical services, our higher education and also our creative industries, especially in the film industry. We can see that there is huge potential for us to work with cities in the Guangdong-Hong Kong-Macao Greater Bay Area to take forward these important sectors. 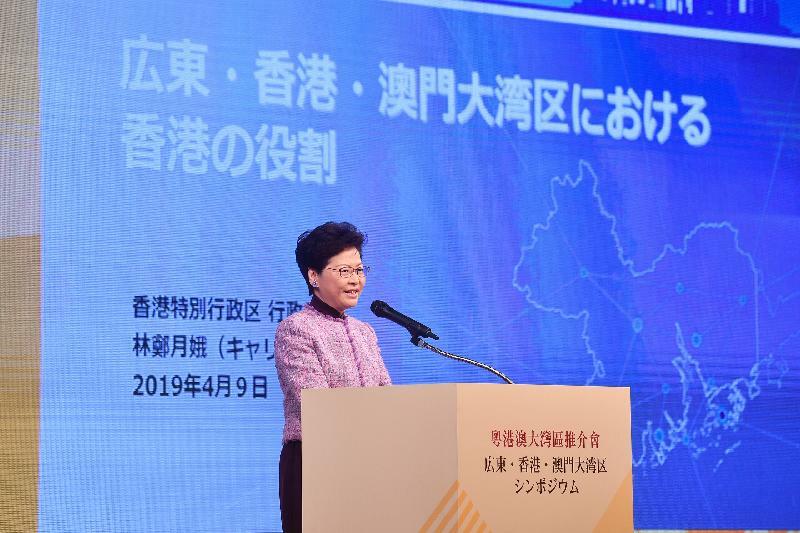 Finally, I want to end with this message: Hong Kong stands ready to connect Japan with the Guangdong-Hong Kong-Macao Greater Bay Area because of very close ties between Hong Kong and Japan. Japan is Hong Kong's fourth largest merchandise trading partner and Hong Kong is Japan's eighth largest. There are close to 1 400 Japanese companies in Hong Kong. In fact, this makes Japan number one in terms of the number of overseas companies, slightly above American companies in Hong Kong. And what is significant is that of these 1 400 Japanese companies, about 40 per cent are using Hong Kong as their regional headquarters and regional offices, so they are rather sizeable companies. I am sure many of the Japanese enterprises represented here this morning have an office in Hong Kong. And we have very strong people-to-people links between Japan and Hong Kong. There are over 450 flights every week between Hong Kong and Japan to 15 destinations in Japan. In terms of tourists last year, 2.2 million Hong Kong passenger trips came to Japan. That is a very strong indication of the close links and friendship between Hong Kong and Japan. I made a very successful five-day visit to Tokyo last October and met with a lot of people, and attended meetings and seminars and so on. And as a result, this gives me added confidence that we should work together in concert and in complementarity, so I've come here a second time within six months. This gives me a lot of enjoyment - especially this is the season for cherry blossom so it is an added bonus to come to Japan at this point in time. So let's seize the opportunities in the Greater Bay Area development together and thank you once again for coming to this symposium.